Sapa town is the most attractive tourism town of Vietnam. 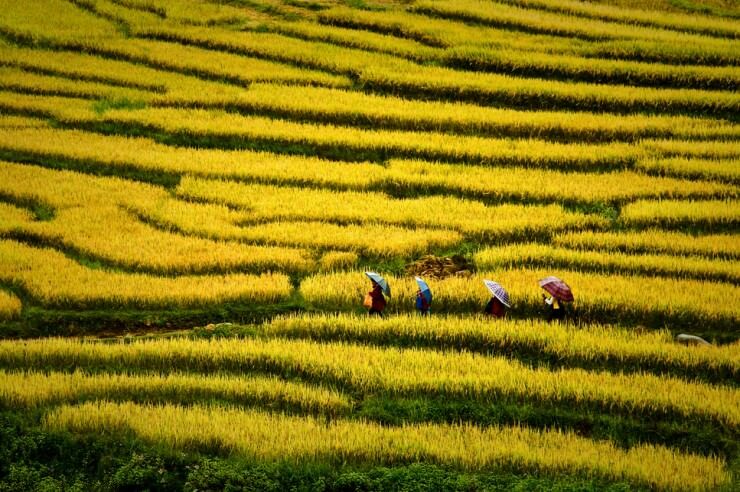 However, the most exciting in Sapa you should not miss is to admire at terraced rice fields at villages in Sapa, Lao Cai. It makes tourists come here surprisingly for its bewitching beauties. It contributes for unique tourism product for the northwest of Vietnam. 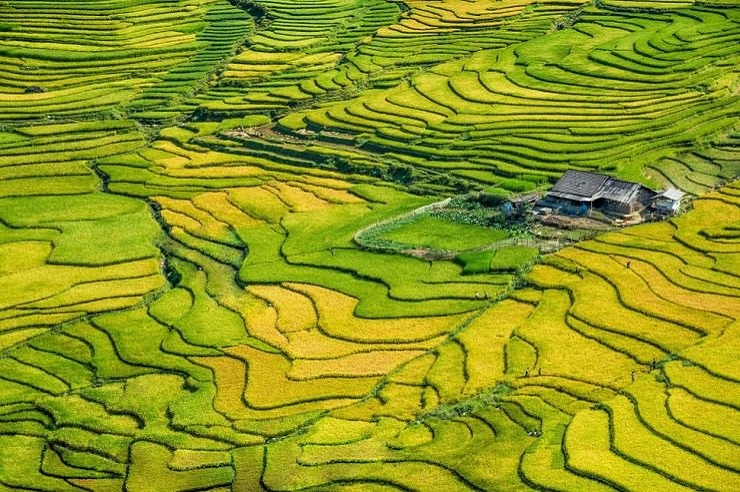 Voted as world’s most beautiful rice terrace, this can be on top of your must-see list if you intend to trip to Sapa since it is definitely worth you a visit. 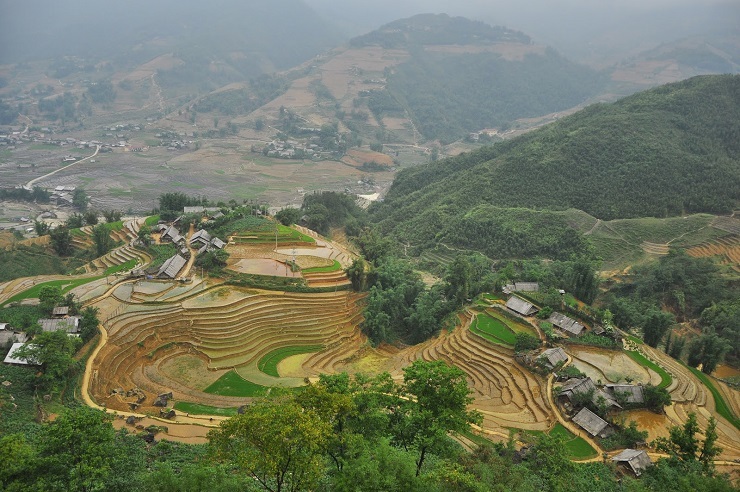 Rice terraces having appeared in Sapa for hundreds of years are built by competent hands of the Dao, the H’Mong, the Ha Nhi, the Tay, and the Xa Pho and more, from a generation to the next one continuously. Huge and terrific rice terraces here not only provide with the best views of the harmony of agriculture and the Mother Nature for travelers in the sense of tourism industry but also, for the initial purpose, they have been “natural rice factories” which have raised the ethnic up to now in the context of hard living and severe climate conditions as in Sapa and generally in the North West mountainous zone of Viet Nam.Due to the tough and impedimentary terrain not for regular cultivation methods as done in the deltaic regions, it is used the measure of terracing cultivation utilizing the favorable conditions of the wide range of mountains in the North West Zone and Sapa in the narrow sense. This has been considered the most efficient but suitable approach of agricultural farming, in the upland for a long time. Ethnic people of the Dao, the Dzay and H’Mong are always proud of their rice terraces which are a precious natural basket of food providing with rice and other farm products for the ethnics’ living. The zone is in a subtropical monsoon microclimate. In May and June, when people in the North West of Viet Nam call it “the water pouring season”, the rain season comes and it is time to start the ethnic’s new cultivation annually. Additionally, it is time to appear the most breathtaking views of the panorama of Sapa town in summertime when you can contemplate the fantastic beauty of rice terraces surrounding high mountains of the town as well as in its neighborhoods like Bac Ha, Bat Xat and Si Ma Cai. It is said that rice terraces are the most beautiful when it has just started the crop at which it begins the rain season or when the whole fields are green or when they are all ripe with the silky yellow coverage. In a certain time, Sapa always looks terrific and so are its rice terraces. In May, it is time that Muong Hoa Valley is blooming with lots ofcolorful flowers in a wide range of various beauties and when the rice terraces are full of water at which you can contemplate one of the best scenery ever that the terraces are twinkle and attractive with the reflection of the sunshine on the fields’ surface. It is definitely worth visiting as you cannot find anywhere else in other place out of Sapa and its splendid Muong Hoa and of course, superb rice terraces. 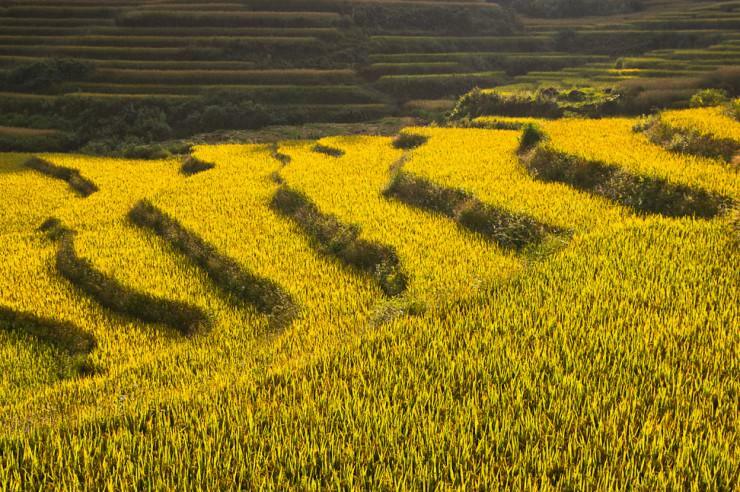 Then the whole fields of rice terraces turn into silky yellow when it is in September and to October, giving the signal of the harvest time. In short, tourists can visit Sapa’s rice terraced fields in any time of the year since the terraces look like a big mirror reflecting the sunbeam in spring, attract lots of travelers with its green spread like a splendid carpet of the nature in summer, while they turn into gold carpet when the harvest time comes in the late autumn as well as the superb and pristine beauty as it is in winter, in which it is covered with fog or sometimes with snow, creating the best-ever picture of the rice fields in winter that you may have never seen before. If you have a chance to travel to Sapa, you can contemplate hundreds of rice terraces which look like being built in the halfway up to the sky. 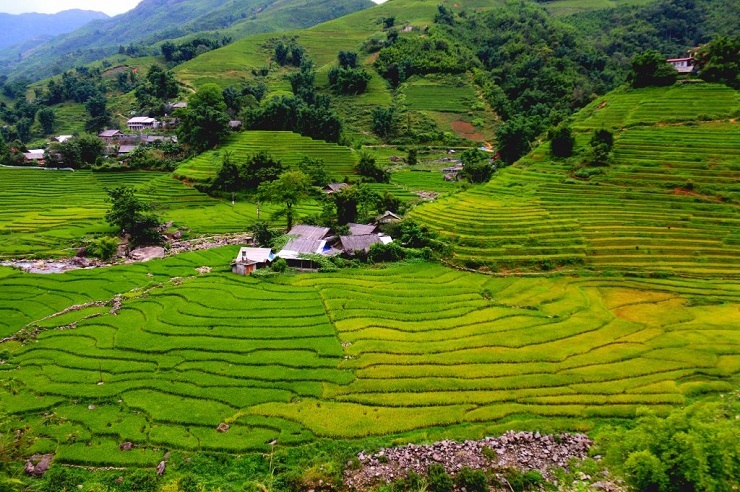 It will be very amazing that you are in Muong Hoa Valley since you will catch numerous rice terraces spreading out the valley, along with Muong Hoa stream as a giant arm winding between the two splendid and superb ranges of mountain. These terraces belong to the Giay in Ta Van commune to the south east of Sapa town, also spreading out Lao Chai commune and Hau Thao commune. Scattered around the terraces those are ethic villages with a few small houses, the fields look more attractive and lively. Therefore, when visiting rice terrace fields in Sapa, you will witness the scattered wooden houses around the terraces those are ethic villages with a few such small houses depicting harmonically and naturally for the picturesque beauty of Sapa’s panorama. It deserves a visit of the Mong’s rice terrace field in Vu Lung Sung, Trung Chai commune, SaPa since it is voted by readers of one of the best travel magazine – Travel and Leisure, US as one of seven most splendid and superb rice terraces in Asia and worldwide. 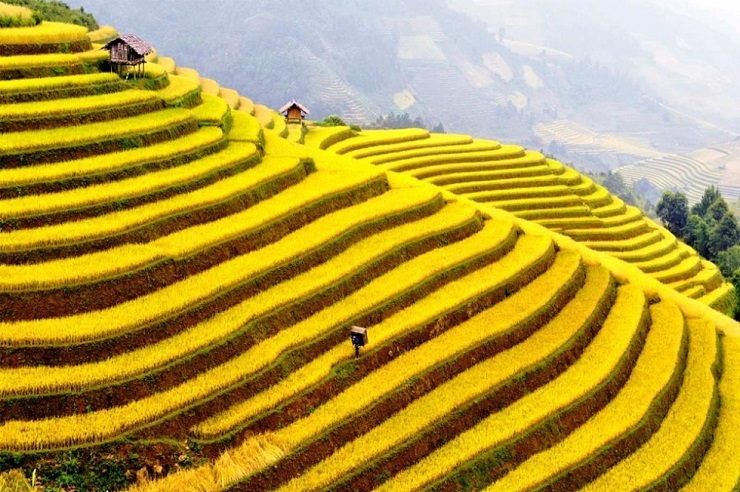 This rice terrace gets 121 terraces with the sloping foot and narrow parts above, which brings the so unique and wonderful image of the terraces as a ladder up to the sky that you can’t help mark 10 out of 10 for the terrific experience and marvelous impression. Anyway, on the tripping path, you can have chances to contemplate the beauty of the terraced fields along with the numerous mountain ranges in Sapa. It is said that rice terraces in Sapa have appeared for over centuries and it are getting more and more reputation as one of the most terrific landscape that deserves to be a World’s Natural Heritage. Followings are best titles of Sapa’s rice terraces in national and global terms. 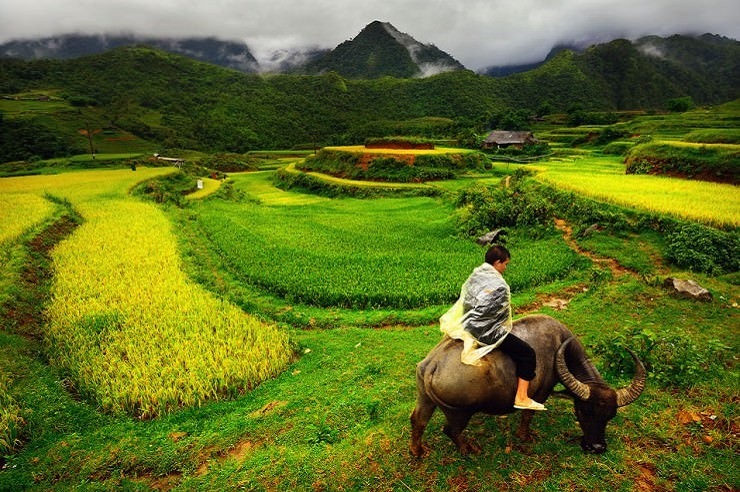 – One the seven most beautiful and impressive rice terrace fields of Asia and the world: ranked by readers of the US’s magazine Travel and Leisure in 2009, in which Sapa is said to get fascinating land views as stairs up to the sky. – National Heritage: it was ranked as to be one National Heritage on 18 October 2013, including rice terraces in Lao Chai Village, Ta Van Village and Hau Thao Village. Sapa’s rice terraces shall be combined with MuongHoa Ancient Rock Field (National Heritage) and Hoang Lien National Park (ASEAN Heritage Park) to form a complex site submitted to UNESCO for being a nominated World’s Cultural Heritage. Eventually, whether it has been a heritage of the nation or in international term, it is a must for all of the travelers coming to Sapa, particularly for those who are addicted to adventurous and trekking activities. You can trip to Sapa for a visit of rice terraces here all-year round since it is always ready with its own beauty and charming in each season, waiting for tourists to come and enjoy.